Contribucion al estudio de los sarcomas. Córdoba : El Interior, 1889. Description : -88 p., [4 l. pl.] ; ill.: 4 phots. ; 25 cm. Photographs : 4 albumens mounted on separate leaves. 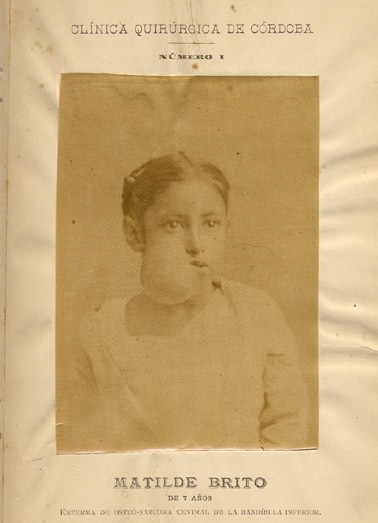 Subject : Jaw — Sarcoma. Author caption: RAMON S. ARCE IBAÑEZ. Title page content: Tesis presentada para optar al grado de doctor en medicina y cirujía. Scarce. One copy located in Amsterdam at the Bibliotheek Universiteit. 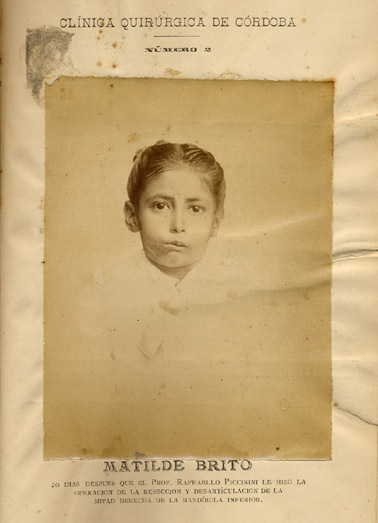 A solid work on sarcomas comprising first a review of the literature followed by a case report and photographs illustrating the surgical removal of an inferior maxillary osteosarcoma in a 7 year-old child. Plates 1 and 2 are before and after portraits of the procedure. Plates 3 and 4 are two perspectives of the specimen.